Calligraphy students know Paul Veres as the bright, witty gentleman who teaches Chancery Cursive upstairs at Castle in the Air. Downstairs, he’s the keen-eyed supplier who keeps our book, pamphlet, and greeting card selections stocked with colorful reproductions of classic images. Half scholar, half bloodhound, and all artist, Paul finds, polishes, and repackages pictures that delight modern audiences as much as they did originally, sometimes as long ago as the Middle Ages. 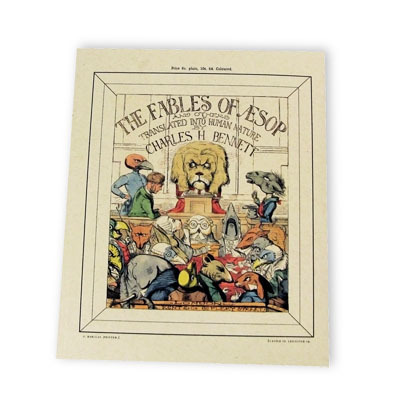 He loves finding the humor in these old works and is always careful to provide information about their provenance for others fascinated by this aspect of the history of publishing. What is this latest treasure you’ve brought us, Paul? 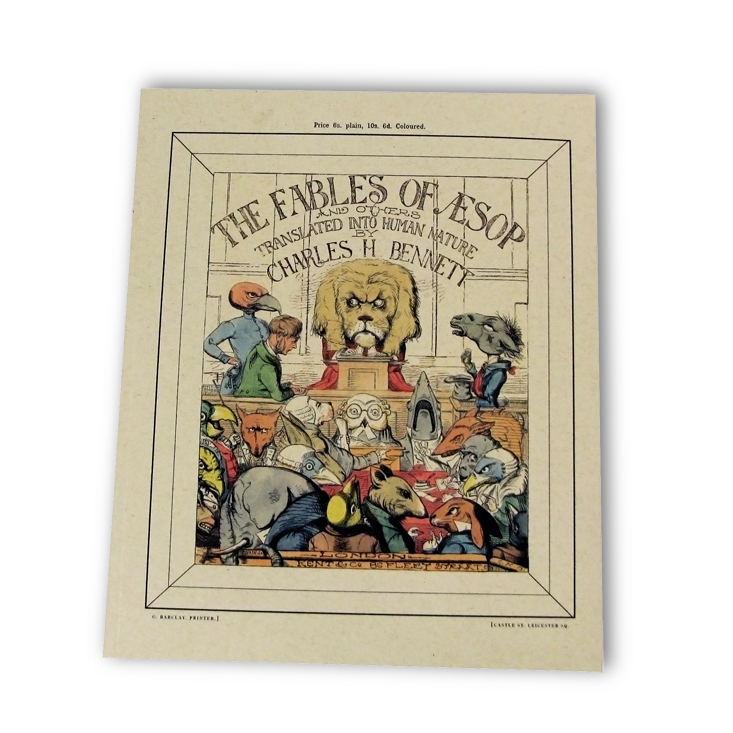 This is a reproduction of a book of The Fables of Aesop by Charles Bennett from 1857. I first learned about this edition when I saw two prints from it for sale at an antique shop in Petaluma. The pictures were printed from engravings and hand-colored. The humor and the delicate nature of the images fascinated me, and I wanted more. So when I saw the original bound edition at the International Antiquarian Book Fair in San Francisco earlier this year, I snatched it up. With some effort and some late nights I had the book reprinted and bound as you see here. I’m glad to be able to share the book in this form so more people can enjoy these rare and delightful pictures. How is it that you transitioned from being a high-school art teacher in Danville to someone who searches the world for whimsical imagery? I learned to use Photoshop long ago and figured out how artists use it to reproduce their work. My interest in old, often humorous or quirky images drew me to flea markets and antique shops specializing in prints and drawings. 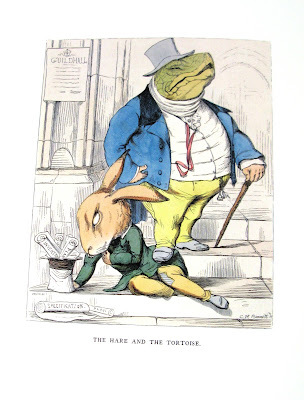 Dover had been publishing books full of copyright-free images for decades, and artists and designers have always loved them for that. Now with the Internet, more images are readily available for anyone to use. Of course for my work I can’t always rely on downloads, some of which are still in copyright and nearly all of which are scanned too poorly for print reproduction. But the Internet is unbeatable as a starting point for any treasure hunt. Some of the images on the cards you bring us seem pretty old. What is the historical range you cover? I’m interested in images going as far back as hundreds of years. Most of my images come from old books and ephemera I’ve collected. I have books of botany drawings from the 1500s called “herbals.” The plants are described in Latin and pictured in hand-colored woodcuts. These books were printed on some of the earliest European printing presses. The pictures and phrases end up on my greeting cards. People like the pictures or perhaps they have a personal connection to the plant. Castle in the Air sells original and reproduction paper theatres. These begin as printed sheets that are cut and assembled to make the scene. 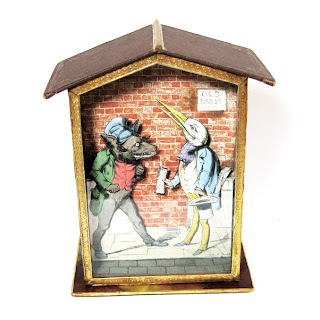 The theatres were printed by Pellerin & Co. in Epinal, France, and for generations were a favorite pastime for children. Pellerin was the first company to produce popular images and books in color. Their scenes and characters still captivate, and I use them for some of my projects. What other reprints have you especially enjoyed finding? Most people who recognize the illustrations of W. W. Denslow saw them first in L. Frank Baum’s first Oz book, The Wonderful Wizard of Oz, published in 1900. 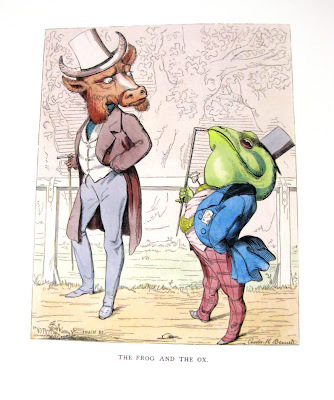 I learned that Denslow produced and illustrated 18 of his own books of nursery rhymes and tales, and I got hold of them all and was able to reproduce them full-size. I also enjoy the Fables of La Fontaine, published by the French company Librairie Hachette in 1929 with drawings by Felix Lorioux. The wily wolf in his stories shares his wisdom through his woodland adventures and is very charming. 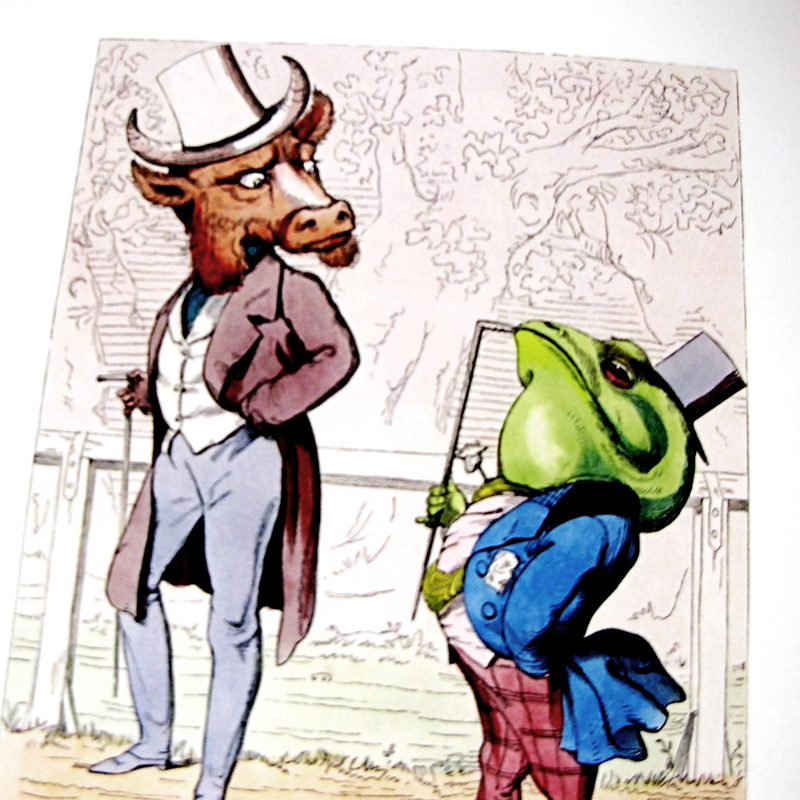 Lorioux also illustrated two other books I reproduced, La Malade Imaginaire and Don Quixote, or Don Quichotte in French. And how did you come to your other passion, the calligraphy you teach at Castle in the Air? An artist buddy of mine was asked to teach a calligraphy course. Because he had already planned to be travelling during that time, he said I would teach instead. I’d never done any calligraphy before, but I taught myself and managed not only to teach those classes, which were at Contra Costa College, but classes at other Bay Area adult schools for many years. Now that I’m retired I can do this at Castle in the Air. Paul Veres will teach the five-session Chancery Cursive course at Castle in the Air beginning Tuesday, May 7th. Sign up by calling (510)204-9801 or through the Online Shoppe. This is a sneak peek at a class John McRae will teach this summer. This nodder shadowbox was inspired by a Victorian model John has in his collection and animates the illustrations from the Aesop book. Paul's work is so fun! I know he does quite a bit of work to enhance the color and quality of the old images. He produced a calendar based on Denslow's nursery rhyme book about what a young boy wants to be when he grows up -- a fireman, a cowboy, a circus clown, etc. I took five of the images and framed them, and they are wonderful. Plus very amusing!